Get ready for the holidays with a whiter and brighter smile! We are offering a special teeth whitening kit with professional strength whitening solution for just $99! The regular price for this kit is $300, so take advantage of this special that will give you pearly whites for the holiday season. This offer is only good during December, so please call today to reserve your kit! Our professional whitening solution and personalized custom whitening trays are more effective and the results last longer than store-bought whitening strips. The custom trays last for years and are yours to keep. As needed for maintenance, additional professional strength whitening solution will be available for purchase through our office to use in the trays. Using the trays and solution once or twice a year will keep your smiles brilliant! Our Hibiscus Dental staff looks forward to celebrating with you during this special time of year! Hibiscus Dental is Hiring a Hygienist! Halloween Candy Buy Back is Here! 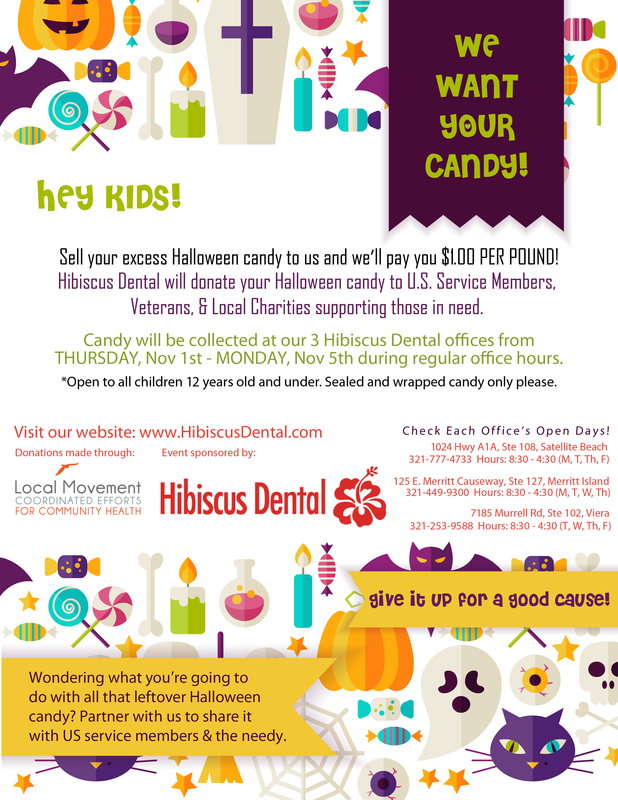 Halloween Candy Buy Back in Brevard is Here! Hibiscus Dental offers services to those who are young and those who are young at heart! We offer specials to first time patients an our military patients. Hibiscus Dental is proud to use state of the art technology in the dental services we provide!